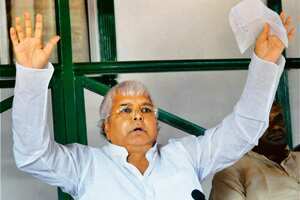 Patna: Rashtriya Janata Dal (RJD) chief and railway minister Lalu Prasad on Sunday called for resignation by members of Parliament and state lawmakers from all parties in Bihar to mobilize public opinion against divisive elements. The minister’s statement came barely four days after state’s ruling coalition leader Janata Dal (United) announced that all its five Lok Sabha members would submit their resignation to Speaker Somnath Chatterjee on 7 November if the anti-north Indian campaign in Maharashtra was not checked by then. “The all-party delegation that met Prime Minister Manmohan Singh on 27 October to seek action against those spreading the poison of hatred and causing deep disaffection among various sections of people had sent a very positive message across the country. The JD(U) has brought it all to a nought by taking a unilateral decision," Yadav charged, saying the announcement could not have been made without Bihar chief minister Nitish Kumar’s sanction. The RJD president alleged that the threat of resignation was issued by the JD(U) as the term of the current Parliament was to expire in a few months and the MPs had little to lose. Though the all-party delegation met the Prime Minister with the intention of seeking action against Shiv Sena leader Bal Thackeray and Maharashtra Navnirman Sena chief Raj Thackeray, there was no mention of their names in the memorandum submitted to him, Yadav said.